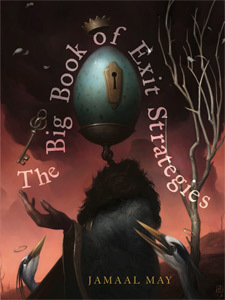 Jamaal May’s collections of poems are Hum (2013) and The Big Book of Exit Strategies (2016), both published by Alice James Books. His first collection, Hum, is a “bittersweet love song” to the ruined streets of his native Detroit—using images of technology past and present to render the “hum” that drives human identity and connection—while the poems in The Big Book of Exit Strategies “are at once an extended ode to his hometown, Detroit, and a resounding protest against the many violent and oppressive ills that plague America” (Publishers Weekly). 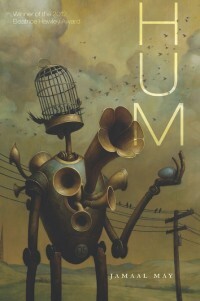 For Hum, May won the Beatrice Hawley Award, the ALA Notable Book Award, and was a finalist for the NAACP Image award and Kate Tufts Discovery Award. He has also published two chapbooks, The God Engine and The Whetting of Teeth. May’s poetry has been published in Poetry, The Believer, Ploughshares, New England Review and The Kenyon Review. His work has been recognized by Cave Canem, Bread Loaf, the Lannan Foundation, and the Indiana Review. He has also been a recipient of the Kenyon Review Fellowship at Kenyon College, Bread Loaf, Callaloo and the Civitella Ranieri Fellowship. May’s career as an editor and teacher began when he taught poetry in the Detroit public school system. Since then, he has also been on the faculty of the Vermont College of Fine Arts MFA. He has served as an associate editor of West Branch and the series editor, graphic designer and filmmaker for the Organic Weapon Arts Chapbook and Video Series. May is also an a member of six national poetry slam teams, including five from Detroit and the NYC-based LouderARTS team. He is a three-time Rustbelt Regional Slam champion and has been a finalist at several national and international poetry slams. Following Jamaal May’s award-winning debut collection, Hum (2013), these new poems explore parallel landscapes of the poet’s interior and an insidious American condition. Using dark humor that helps illuminate the pains of maturity and loss of imagination, May uncovers language like a skilled architect—digging up bones of the past to expose what lies beneath the surface of the fragile human condition. the diaphragm, a fist clenching at the bottom. like insects running from my breath? with impatiens stuffed in their window boxes. will you hold your breath before you knock?